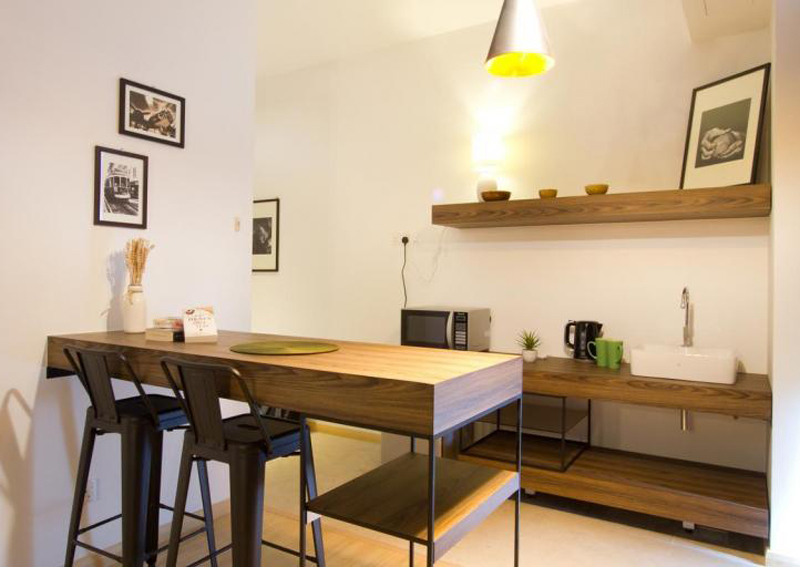 Booking an accommodation for your holiday? You'd better check out the reviews first. A man in Malaysia said that he was cheated of RM4,878.50 (S$1,616.50) after making a lodging reservation in South Korea. In a Facebook post on Oct 14, Xavier Aranggoi Maurice wrote that he had booked two apartments for eight people in Myeong-dong, Seoul, from Oct 11 to 19. 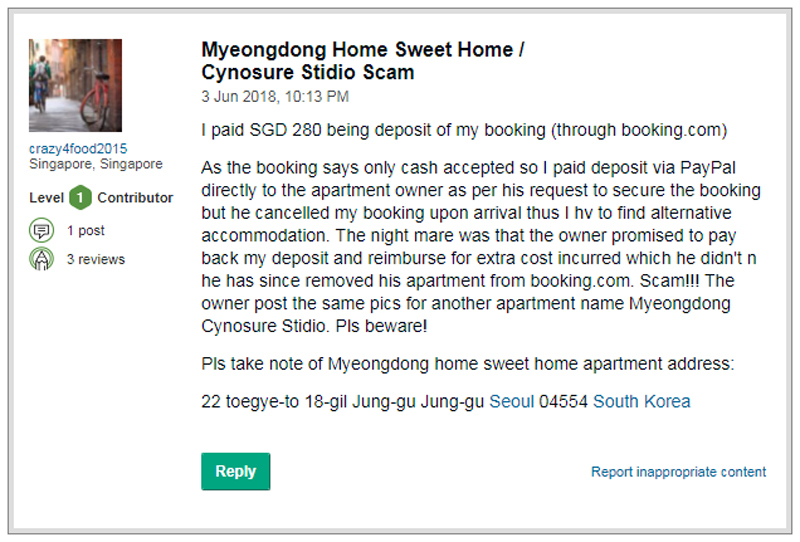 Two months before Xavier was due to visit the South Korean capital, however, he was asked by Eric, the apartment owner of Cynosure Stido, to make payment for the booking. To hold the reservation, Xavier had to make payment within 24 hours, he said. Xavier eventually transferred the money to Eric through Alipay on Aug 17. After receiving payment, the owner stopped responding to Xavier's requests for confirmation of the booking. Three weeks later, Xavier was notified by Booking.com that his reservation had been cancelled. When he messaged Eric about the cancellation, he received the message: "Hello, please contact property owner about details. I am not working here anymore." That led Xavier to warn others about a potential scam on Facebook. A quick check online revealed a string of negative reviews on the same accommodation over the past three months. 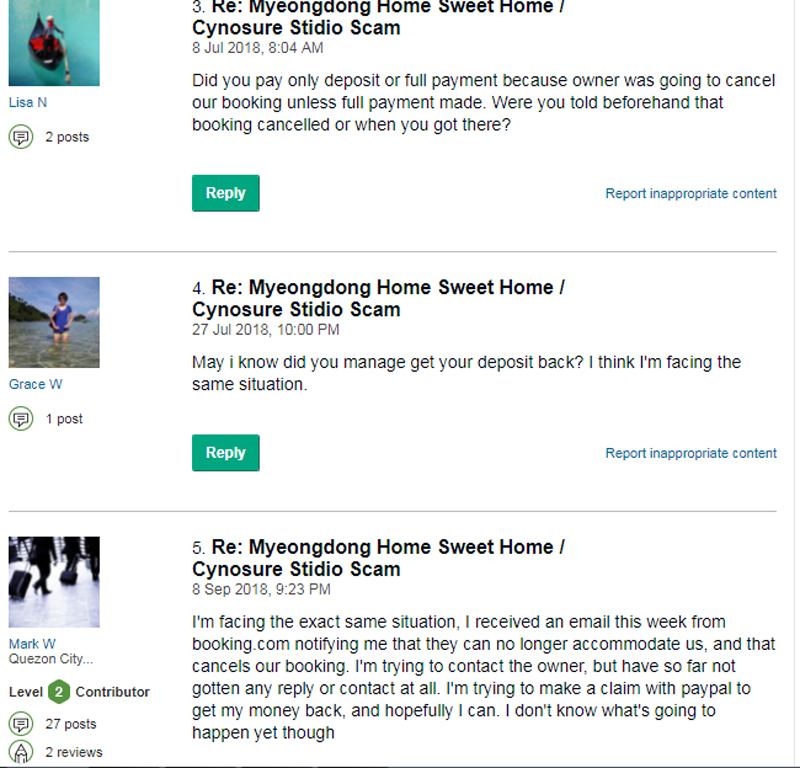 All 18 reviews of Cynosure Stido on TripAdvisor warned of a scam. The reviews have since been removed from TripAdvisor. Booking.com has also delisted the property. In a separate forum thread, other travellers said they were deceived under similar circumstances. Some users wrote they arrived at the address but couldn't find any apartment there, while others said they were unable to get refunds. 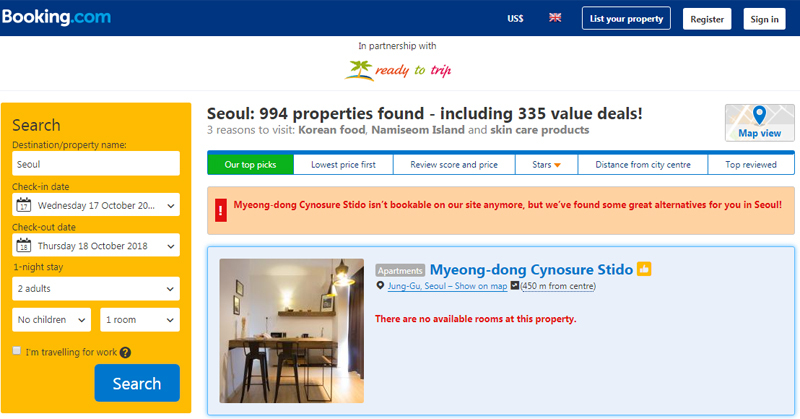 A Booking.com spokesperson told AsiaOne: "In this rare and specific instance, the property has been removed from Booking.com and we have worked with the guest to organise a full refund." She added: "As a leading e-commerce company, at Booking.com we are constantly optimising the robust security measures we have in place to protect our customers and partners." A TripAdvisor spokesperson said in a statement: "This property should not have been listed on TripAdvisor and was removed once our community reported a concern." "As the world's largest travel website we are constantly enhancing our systems and are reviewing our processes to ensure similar situations do not happen again in the future."